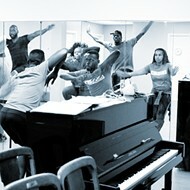 Dancers in rehearsal for Dirt, choreographed by Jennifer Archibald. Presented by MADCO March 31 and April 1 at the Lee Theater at the Touhill Performing Arts Center (1 University Blvd., touhill.org). Tickets are $30 to $50. 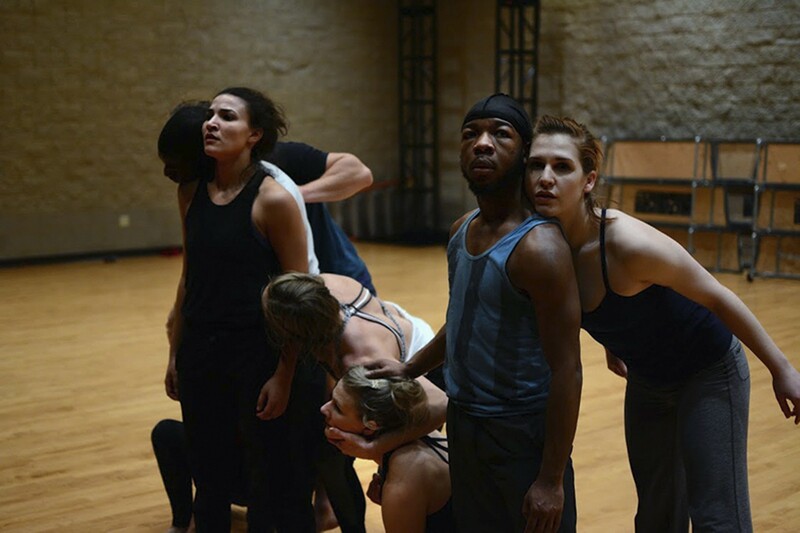 After protests erupted in Ferguson in 2014, Stacy West, artistic director of the St. Louis-based modern dance company MADCO, looked for a way to respond to the situation. But the timing didn't seem right. "I felt that there were other artists that could come in more quickly than MADCO with a response to what was going on in Ferguson. Due to the nature of dance and hiring choreographers and booking venues, I didn't feel we were the people to do something quickly," West explains. She found herself thinking about a way to tackle the topic ever since. But then, while working on a performance for Washington University's John M. Olin Library, she learned about its extensive archive of civil rights history. She felt the collections would be the perfect inspiration for a future MADCO show, so she and the company went to take a look in August. Suddenly, West was face-to-face with photos documenting civil rights history, from the early half of the twentieth century to the unrest in Ferguson. She immediately saw the artistic possibilities. "I was looking at the material from the 1950s and comparing it to what was going on in Ferguson and saw that in some cases, there looked to be no difference in the pictures between the 1950s and the present day. And that's what struck me the hardest," West says. The other thing that stood out? The fact that these pieces of history were sitting in a box in the library, and no one was seeing them. That will all change this weekend, when MADCO presents FREEDOM, the finale of its 40th anniversary season, at the Lee Theater at Touhill Performing Arts Center. Four international choreographers have been invited to choreograph individual pieces inspired by the Olin Library's civil rights material. Though all four began with the same source material, the choreographers have created four unique works — with their backgrounds and life experiences giving them varying perspectives. Cecil Slaughter grew up in the South, while Nejla Yatkin was raised in west Berlin at the time of the fall of the Berlin Wall. Jennifer Archibald is Canadian but currently resides in Brooklyn, while Gina Patterson, the founder of VOICE Dance Company, is currently based in Wyoming. All four combine live music and movement to bring civil rights-inspired work to life on stage for FREEDOM. Take Patterson's piece, for example. The choreographer saw all sorts of disturbing images while examining the collection, from people celebrating another person's murder to white people making ugly faces as black students entered schools for the first time. Rather than focus on one specific moment, however, Patterson created a piece made up of many subtle layers of history to emphasize that we're all human. Titled "It Is," the piece is not intended to be a literal interpretation of the struggle for civil rights, but rather flows in and out of different images. At one moment you may see dancers making walls with their bodies to create a sense of separation, while at another you may notice defeated posturing that is reflective of slavery. The costumes are skin-toned to reflect that human element, and the music is classical and repetitive to maintain a sense of timelessness — because, as Patterson notes, many civil rights-related issues are timeless as well. "That's another thing I think the piece is reflective of: Do we really ever overcome these issues, or do they just look a little different?" she says. "Are they constantly morphing and evolving and just looking a little bit different, but it's not exactly that they're gone?" 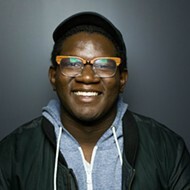 Patterson sees FREEDOM as not only an opportunity for entertainment, but also as a chance to partake in a current conversation and really listen to others. "I think it's important because it's an ongoing dialogue and it's so current today, especially today. Regardless of your political beliefs and social beliefs, I feel like there's so much division, two sides of things," she says. FREEDOM comes at a pivotal time time in MADCO's history. The company celebrates its 40th anniversary this season. While MADCO stays true to its roots with its emphasis in education (the company has taught more than 600,000 students over the years), it has also seen its fair share of changes over its four decades. What started as a company of six dancers based at Southern Illinois University-Edwardsville eventually moved to rehearsal spots at St. Marcus United Church of Christ and then a studio in the Central West End, until its current company of eight to twelve dancers found residency at the Touhill. MADCO's material has also changed over time to remain relevant — from creating one of the country's first spoofs on The Nutcracker to creating a STOMP-like piece called Junk Garden before STOMP was even created. "I think that the company has always looked at what's trendy and what people are doing, and it's been on the forefront of it. It's just been here in St. Louis," West says. "And I'm pretty proud of that." West realizes that some people may have expected her to do a retrospective for the company's 40th anniversary. Again, she says, the timing just didn't seem right. "What I'm interested in doing is building new work and using dance to speak about what's relevant in our society today," she says. "I was much more interested in doing that than looking backwards." Editor's Note: A previous version of this story incorrectly stated choreographer Nejla Yatkin's place of birth. She was born in Berlin, not Turkey. We regret the error.